Will do. Thank you for bringing this to our attention. You are welcomed to contact relations@hitbtc.com. Thank you for your interest in HitBTC! Indeed you will. And we will report to you. We hope you'd forgive us for this delay. We're so happy to read that. Thank you for your trust. Your coins are going to be with you within several hours. Does the problem still exist? It may sound peculiar, but just simple clearing your cache & rebooting your browser is likely about to help. We're here for you! Problem solved. That fee amount being displayed is a worst case scenario. It's likely that you won't pay amount like this ever. What exactly is that scenario? This one: your order is being executed by a bunch of tiniest trades possible. It's important to understand that if you're performing a tiny trade with a cheap currency, the fee amount is being rounded, because it couldn't be less than 1 satoshi, for example. So, if you're performing a whole set of these trades, the total fee amount being summarised could reach frightening amount. In reality orders are barely executed like THIS. That's why there's no need to worry. It's safe. Thank you for trading with us! - you can only buy up to 85% of your total balance at a time. Have 1 BTC and you want to buy 1 BTC worth of XMR? Should be simple right? Not for HitBtc. You can only buy 0.85 BTC worth of XMR. You would then have to place a second order for no more than 85% of the remaining 0.15 BTC, and so on. Ridiculous! Apparently they don't even check their support system, you need to post on Bitcointalk to hopefully get one of their staff to look at your ticket, as evidenced by the post right above this one. 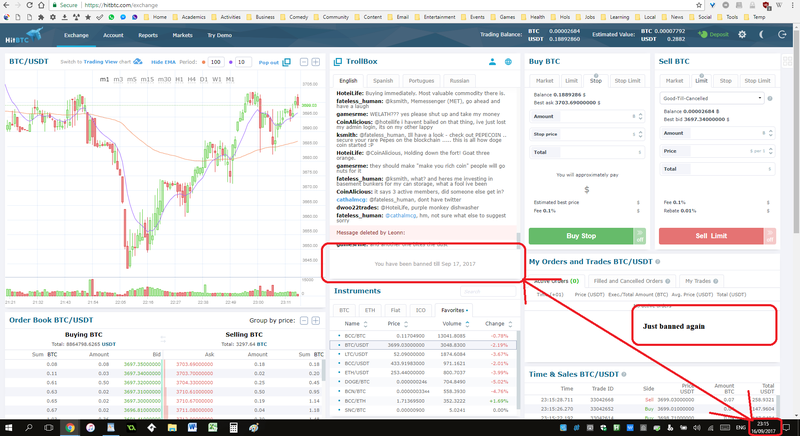 The "Reports" section could be found on the main exchange window. There's the "My orders" subsection. you can only buy up to 85% of your total balance at a time. Have 1 BTC and you want to buy 1 BTC worth of XMR? Should be simple right? Not for HitBtc. You can only buy 0.85 BTC worth of XMR. You would then have to place a second order for no more than 85% of the remaining 0.15 BTC, and so on. Ridiculous! Sorry, we're not exactly sure about what do you mean. It shouldn't be like this. There shouldn't be any trouble selling BTC for XMR. What exactly happens as you're trying to do it? We do. Every ticket will receive its reply. Please accept our apologies for any inconvenience you've faced with while trading with us. We're constantly improving our service, and would be extremely glad to prove it to you. We are extremely sorry that we are leaving such impression. HitBTC is one of the oldest cryptocurrency exchanges on the market, but it's always at the forefront and keeps moving forward. It wouldn't be possible for us to come such a long way and be the worst at the same time. Did you even try to reach there report button up? and how long those your problem exist? If this still not credited to your account then its a big trouble since there are so many people encounter that here. And expect that it will take time to resolve that issue since devs team of hitbtc seems slow for taking some action regarding unto that. Yes i so that but nothing arrive in my account its almost 7 hours from now but my hvn didn't appear in my main balance. Hope that i will get my token. That is my bounty and I'm patiently waiting for that bounty. Hope its getting okay. I started using your exchange recently. Very good. Congrats. Dear traders, who are expecting their HVN deposits: they will proceed very soon (if they haven't already)! Technical maintenance has completed successfully, and our wallet is being synchronised with the blockchain, it takes some time. Please forgive us for any inconvenience caused. As I saw somebody get answered, which is very nice thing. But what about my problem? Could you give me an estimated time for solution of my Ticket #23907 ? I got my ETH Today. Today I found my browser (firefox) super slow to enter HitBTC. Checking the performance of the processor I have seen that it is set to 100%, for no apparent reason, and I wonder if it is something they have activated on HitBTC, since in other exchanges or other pages it does not happen to me. Reading, I have found this and maybe it can be the reason. Ok, now i have enough !! What the hell is going on??!! Hmm, can't get even the main page to load for hours now using Chrome, but got it to work with MS Edge just now. Not sure it's related, but I got an Adobe Flash update today which I did not install. Maybe the site's getting DDOS'd? Captcha seems to have changed to "pick the photos" unless I'm recalling incorrectly that it wasn't always that way. Yes, the site doesn't load. Hope they fix it soon. And I do have the cpu increase as well. OMG what happend with this site?. any clarification from developer? i try different browser but still lagging. i even can not scroll down the page.